Recently Remodeled! 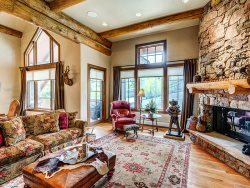 This is a cute garden-level Vail, Colorado condo located one block from Golden Peak and Vail Village. Nice, comfortable family room is bright and friendly. Great unit for skiers/boarders who want easy access to lifts (without driving) and everything the Village has to offer. One-bedroom, one-bath: 2 queen beds. Queen sofa sleeper in the Living Room.